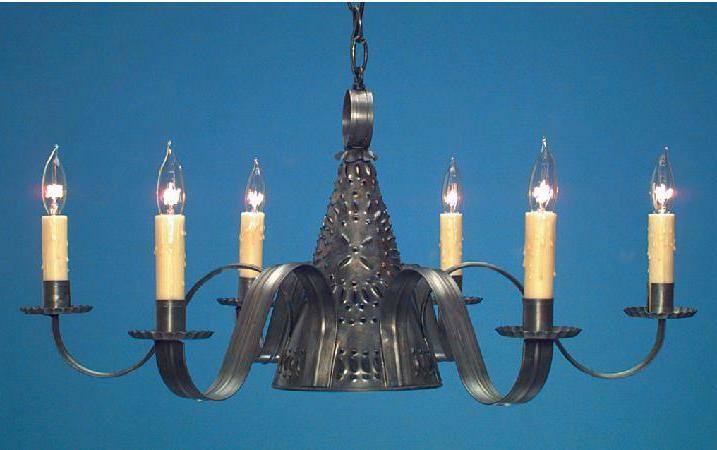 Hammerworks handmade Colonial Pierced Tin Chandeliers are a great choice for your reproduction period home. First of all, you can choose from many sizes and styles. Therefore, no matter the room size or setting, we offer a suitable handcrafted pierced tin chandelier. 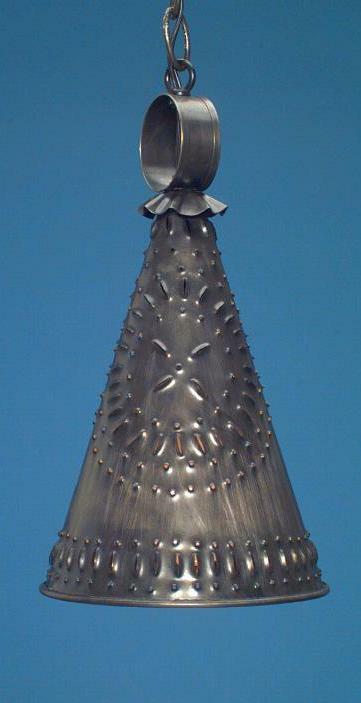 Often called a Colonial Punched Tin Witch’s Hat, models such as CH101 are available with or without the pierced design. Of course, we craft each chandelier in New England. Most noteworthy, we apply the punched design completely by hand, resulting in a pleasing reflection on the ceiling. Most importantly, you can choose these rustic style Colonial Pierced Tin Chandeliers in antique tin or antique brass finish. A variety of arm configurations is also available. Most of all, each chandelier arm accommodates a 60 watt small candelabra base bulb. In addition there is a “down light” in the center, for up to 60 watts of added brightness. Also, each Rustic Farmhouse Style Light Shade comes with a matching ceiling canopy and 2 feet of chain. Of course, extra chain is always available for a minimal charge. 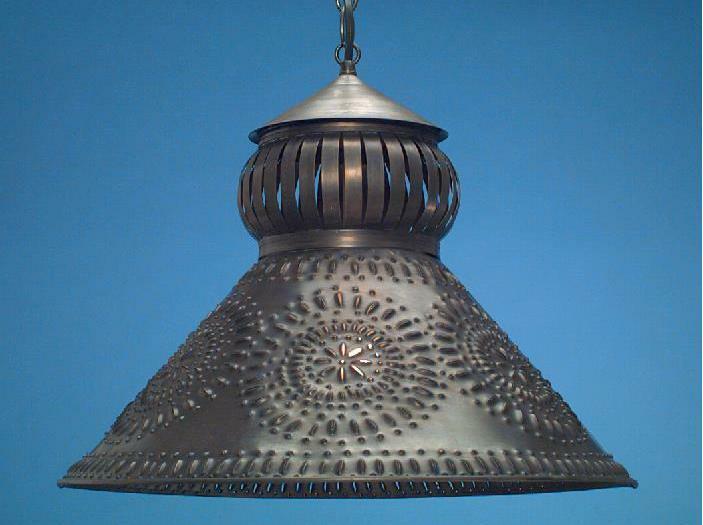 Most noteworthy, Antique Tin Punched Light Shades are a great choice for a country kitchen or dining area. Consequently, for a look of rustic simplicity, place one above a dining table instead of a traditional chandelier. Among the many other functions, they offer a charming option as kitchen island lighting. Or perhaps you are looking for unique rustic pool table lights? In either instance, you can choose to group 2 or 3 pierced shades together along a horizontal bar for completely customized look. Or if you prefer, simply hang them together as a group. Hence the possibilities abound! 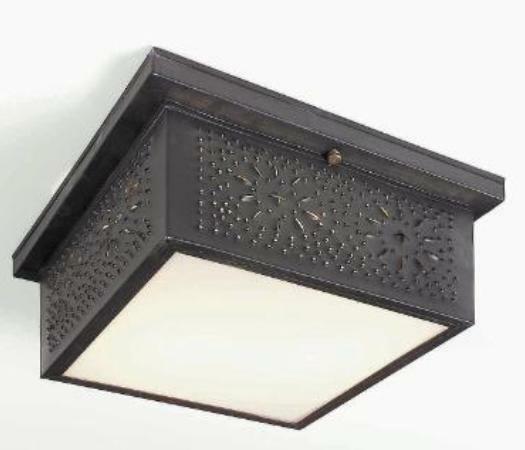 Above all, handcrafted rustic Pierced Antique Colonial Ceiling Lights are made with pride in America. Certainly, these attractive ceiling fixtures combine quality craftsmanship with practical function. Thus, with their compact size, they are perfect for any area with a low ceiling or limited clearance. Furthermore, the reflection of the punched design adds a unique look to any room. No matter what, the versatility of these ceiling lights makes them ideal throughout your home, from kitchens and bathrooms, to hallways and family rooms. 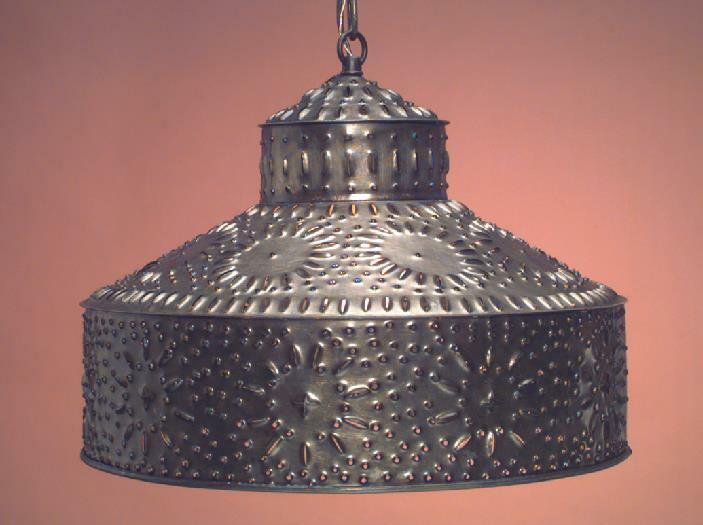 Of course, as with all Hammerworks Lighting Products, we make our pierced tin lighting completely by hand with attention to detail. Most importantly, we hand punch each fixture individually. Also, we offer a variety of style and finish options. 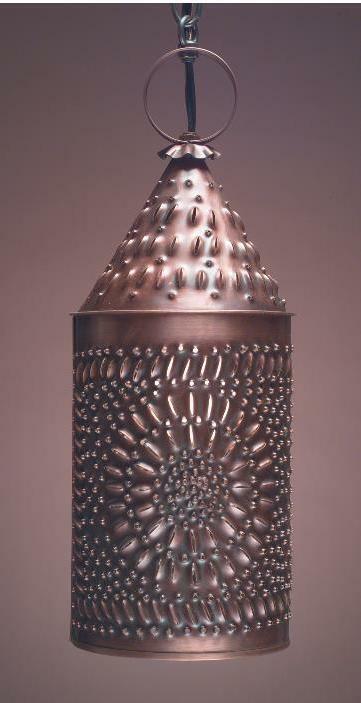 These include antique tin, copper and brass, as well as our custom verdigris or painted black. In addition, we offer both square and round styles. Consequently, no matter the design and color scheme of the room, you’ll find an appropriate choice in our collection. Above all, whether you choose primitive style punched tin chandeliers, pendant shades or ceiling light fixtures, you can always pair them with any of our handcrafted Colonial Wall Sconces. Therefore you can easily complete the design scheme of any room, creating a truly rustic farmhouse style. Most notably, our collection of Colonial Tin Chandeliers coordinate perfectly with the Colonial Pierced Tin Chandeliers. As always, we carefully handcraft each rustic chandelier with attention to detail. Certainly, you will appreciate the exceptional quality of the workmanship we put into each and every chandelier! From country punched tin chandeliers, to elegant two and three-tiered tin models, you will certainly find a satisfactory choice. Thus, no matter the style of your home, from a Farmhouse to a Classic Antique Reproduction, our tin & brass chandeliers offer the perfect look. First of all, our handcrafted Colonial Wooden Chandeliers add beauty, warmth and charm to your home. More importantly, these solid hardwood chandeliers feature a wood turned center and metal arms, in a variety of style, size and color combinations. Each of our vintage wood chandeliers is handcrafted in the USA by skilled craftsmen. Thus, you will always receive exceptional quality. No matter what, the graceful metal arms and hand painted or stained wood adds a rustic, country look to any home. Because we handcraft each of these country style chandeliers to order, you can customize it to your exact specifications. Furthermore, if none of our paint or stain options work for you, we will gladly apply any finish you wish to supply. In addition, these antique chandeliers range in size from the small Country Wooden Chandelier to the impressive Elegant Colonial Chandeliers. Thus, you can easily coordinate the size and style with your decor. 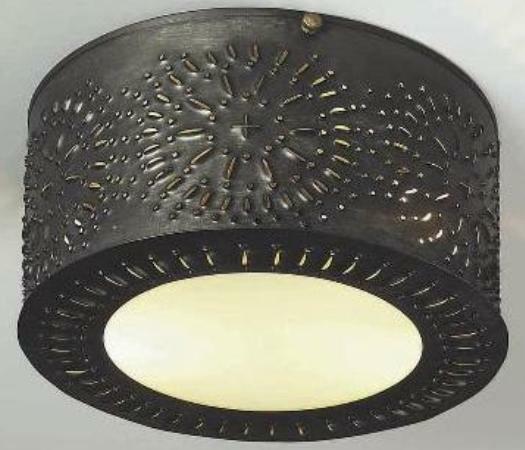 As you can see, we make all types of Colonial Lighting. Not only do we offer an extensive selection of outdoor lighting, our product line extends throughout the interior. 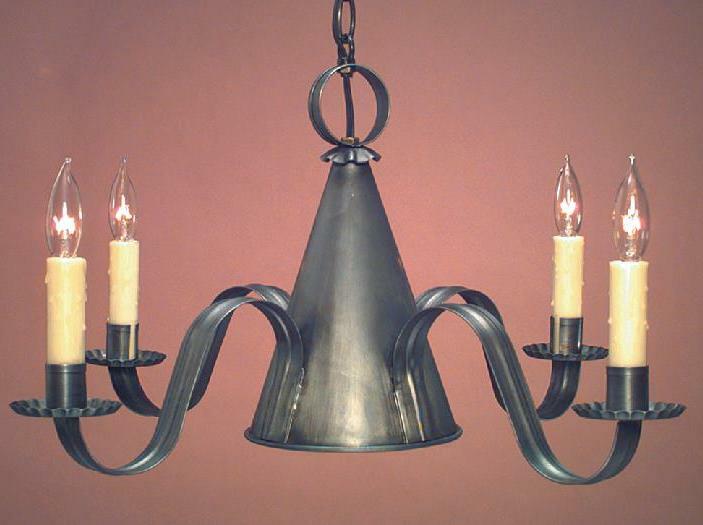 From a Colonial Metal Chandelier Tavern Light for the smallest powder room, to the grand Early American Tin Chandelier CH303 in a great room, we offer many choices. Most importantly, since we handcraft each fixture, custom options are always available. We offer a wide variety of sizes, styles and finish selections. No matter what, whether you need one light or several, Hammerworks is your premier source for superb quality period reproduction lighting.